My Grandma is finally learning how to use Pinterest, so of course she has about a billion recipes that she wants to try and this is one of them. We decided that our first Pinterest Test was going to be a cookie, and this is how they turned out! 1. Mix butter until creamy then add the flour, 1/2 cup of confectioners sugar, salt, vanilla extract, and almond extract. 2. Mix well then refrigerate covered for 30mins. 4. Shape into crescents and bake for 12-15 mins. 5. When cool enough to handle roll the warm cookies in the remaining confectioners sugar. The dough was super easy to make - although it did have to sit and rest for 30mins after it was made. I also accidentally dumped like 3x the amount of almond extract in it than your supposed too - whoops! 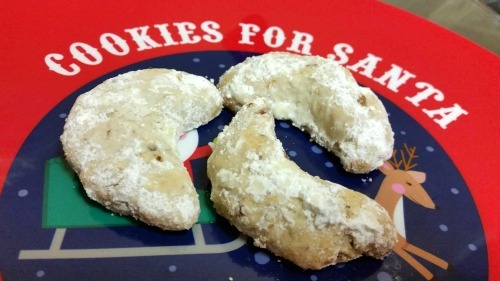 They came out super good though, and they even were probably the favorite cookie this year. Everyone grabbed a these first out of the 6 cookie types we made, so I'd definitely consider this one a hit! See the original cookie recipe.